In the recent years, the spread of counterfeit goods has become global. Statistics show that these counterfeit products harm the global economy substantially. Rapid advances in technology and liberalization of the Indian economy has created an ideal market for people trying to misuse existing brand values that have been cultivated and nurtured over a period of time. Moreover, loss caused by these counterfeit products to a respective brand or client is beyond calculation. If these issues are therefore not properly countered, they may cause permanent damage to the respective brands. Hence, it is pertinent that while investing and developing a brand, brand owners must consider the impact of counterfeiting and develop a global anti-counterfeiting strategy to combat this growing problem to ensure proactive rather than reactive approach. Since India has massive International boundaries with eight neighboring countries, it makes the country vulnerable to counterfeited products. This is hindering India’s economic development, thus, the law of the land provides a wide array of remedies against counterfeiting under various statutes, however, it does not provide a specific law on Counterfeiting. India has no legislation dealing specifically with counterfeiting and piracy, but the legislators, through various statutes have provided statutory, civil, criminal and administrative remedies. However, Counterfeiting has been majorly dealt by Intellectual Property Law as it directly invokes the Intellectual Property Rights of the aggrieved. For instance, Trademark law necessitates appropriate action against passing off, which refers to the imitation of marks or goods in order to take advantage of the goodwill of the lawful owner as well as causes confusion among the consumers. Similarly, Copyright Law provides remedies against plagiarism, which is the act of appropriating the literary composition of another author. Attorneys at Khurana & Khurana have developed significant experience in the area of anti-counterfeiting, especially in FMCG, Pharmaceuticals, Apparels, Footwear, and Medical Devices product verticals, and can assist in devising a comprehensive strategy for curbing counterfeit products by outlining all possible risks and assumptions and mapping them with costs involved in each step taken so that a judicious and objective step can be taken by the client. Attorneys at K&K have also been active in initiating criminal actions and getting seizure orders from various Indian courts against individuals and businesses that have manufactured and distributed counterfeits. K&K has also been active in Trade Mark Registrations and enforcement at Customs. 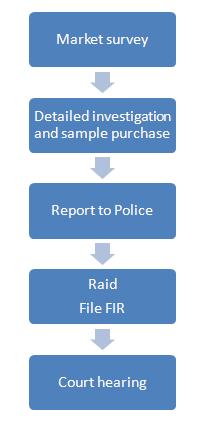 Our efforts have also secured criminal convictions of many counterfeiters, which has been possible only by having a strong understanding of the procedures involved, experience in handling criminal actions and filing suits in right jurisdictions to get desired order and then enforcing them with assistance of the local police authorities. We provide anti- counterfeit services including as civil suit, criminal suit as well as conduct investigation for counterfeit cases. Counterfeiting also referred to as the act of copying brands, has all the more proliferated with technological advancement. This menace has extensively and deeply penetrated the markets worldwide, leading to availability of copy high end brands random street shops of India. In essence Counterfeiting and piracy involves infringement of IPR (Intellectual Property Rights). IP rights, despite of being a private right, which are mostly enforceable through civil litigation provide criminal sanctions as well against its infringement. This is due to the growing instances of counterfeit, passing off and piracy leading to economic damages. Statues such as Trademarks Act, the Copyright Act, and the Geographical Indications Act provide criminal remedies. The punishment varies from 6 months to 3 years of imprisonment and fine ranging from INR 50,000 to 200,000/-. The statutes acknowledge counterfeit as cognizable crime, wherein the police can take action and carry out search and seizure court warrant. Khurana & Khurana has commendable experience in providing relief to its Client through Criminal recourse against Counterfeiters as provided in the following statutes. Indian Penal Code, 1860: The Penal Code sets out punishments for cheating, counterfeiting and possession of instruments for making counterfeits etc. under chapter XII of the Act. The code’s provisions can be invoked in criminal actions, in addition to the provisions of specific statutes. Copyright Act,1957: Provides power to the Police to seize the infringed copies of copyrighted work The Act further empowers the registrar of copyright to investigate any alleged ship, dock or premise and order to confiscate them. Section 63 of the Act provides for imprisonment up to three years and fine for indulging in activities of infringement. The Trade Marks Act, 1999: Section 103 provides penalty for applying false trademark and/or trade description, etc. 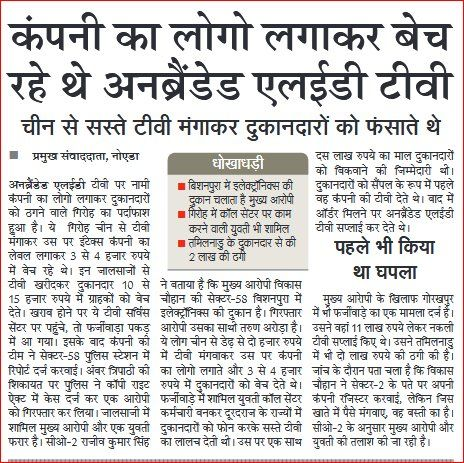 with imprisonment up to three years and fine ranging from fifty thousand to two lakh rupees. The Patents Act, 1970: The Patents Act does not provide criminal remedies. However, criminal liability arises where an article is wrongfully represented to be patented or secrecy requirements under the act are breached. Geographical Indications Act, 1999: Chapter VIII provides for criminal remedies where the term of imprisonment varies from 6 months to 3 years and fine from ₹ 50,000 to ₹ 2 lacs. Anti-Counterfeiting regulations under the Intellectual Property Rights (Imported Goods) Enforcement Rules, 2007: The IPR Rules, 2007 empowers the competent authority of Customs to seize counterfeit or suspend the clearance of such goods at the port. The Rules additionally empowers the Custom Department to destroy goods infringing IPR. The right holder has to send a notice for protection of its IPR to the concerned authority for suspending the clearance of counterfeit goods. Injunctions against sale, manufacture and misrepresentation and orders directing rendition of the infringer's accounts and preservation of information are most effective when accompanied with enforcement of a favourable court order. Right owners have the option to choose between civil suits and criminal proceedings, whichever is strategically better suited to a set of facts or circumstances. Civil remedies are swift, effective and lasting in effect. Criminal remedies take relatively longer and generally have nil returns in damages or costs but can have a chilling effect on the counterfeit trade. Civil remedies against counterfeiting mostly include injunctions, damages and/or rendition of accounts. The mandate of civil remedy is to stop distribution, manufacturing, or retailing of the infringing product or gaining profits from using the pirated/counterfeit products. 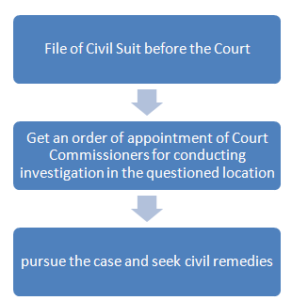 Another important aspect of the aforementioned civil remedies is to forbid an infringer from creating a false impression that the offerings under its intellectual property have some kind of association, nexus or affiliation with the products of the original proprietor of the said intellectual property. Anton Pillar Order: which gives right to the right holder to visit the defendant’s premises along with the local commissioner appointed by the court, to search and seize the counterfeit goods. These goods are returned to the defendant with an undertaking that the goods will be safely preserved until further orders of the court. John Doe Order: It is similar to Anton Pillar order, the only difference here is that the defendants are unknown/ or not known. Moreover, this action is taken when it is difficult to identify the counterfeiter or where the counterfeiter is operating out of temporary premises. Code of Civil Procedure 1908 governs the procedures adopted in the civil cases. Counterfeiting is a widespread commercial crime rather than a conventional one. The CPC has also established a commercial court in High Court, in 2016, which has the jurisdiction to deal with cases relating to ‘counterfeiting’. The first line of defence against the cross-border movement of counterfeited/ pirated articles are the National Customs and Border Protection. The Customs Act regulates the import and export of goods through provisions provided under Section 44-51. Further, Sec 11 strengthens the IP enforcement as it empowers the government to enforce prohibition on the import and export of certain goods to protect Patents, Trade Marks and Copyrights and gives power to the custom officials to confiscate goods imported or exported, unlawfully or illegally. The Government of India had notified the ‘Intellectual Property Rights (Imported Goods) Enforcement Rules, 2007’ with a view to bolster the Customs Act and provide remedies to protect IPRs at borders. Thus, importing of infringing goods is prohibited under the Customs Act 1962, read with the Intellectual Property Rights (Imported Goods) Enforcement Rules 2007. The law allows holders of specific IP rights such as trademarks, copyright, patents, designs and geographical indications to record their grievances with Customs officials for prompt seizure of counterfeit goods at the port itself. Khurana & Khurana is experienced in getting civil remedies for its clients such as Injunctions against Counterfeiters and getting favorable enforcement orders in relation to IPs. We also provide protection of IP rights and IP enforcement at Borders of the Indian territories in compliance with Customs Act 1962, read with the Intellectual Property Rights (Imported Goods) Enforcement Rules 2007. (i) Verification of compliance with existing licensing agreements and ‘cease and desist’ letters or warnings. (ii) Verification of compliance with existing licensing agreements and ‘cease and desist’ letters or warnings. (iii) Carry out an undercover surveillance of a person or business entity. Khurana & Khurana has successfully conducted raids at Mumbai for counterfeit products (trousers) falsifying it to be that of the product under the brand name of woodland. We have proceeded to file FIR for the same along with the police report.